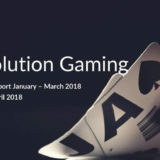 Evolution Gaming has published it first quarter results for 2018 and they look impressive. Operating revenues increased by 30% compared to the same quarter last year, giving a first quarter profit of €16.5m. Salon Prive Tables opened for Blackjack and Roulette. New Studios opened in Canada and Tbilisi, Georgia. CEO Martin Carlesund is very upbeat with the results and plans for the rest of the year. Overall, the first quarter of 2018 has been characterised by growth and profitability in line with our expectations, considering the ongoing investments in both new studios and games. We noted a clearly stronger performance at the end of the period, with good growth and earnings, compared with the beginning of the period. Revenues in the quarter amounted to EUR 51.6 million, corresponding to a 30 percent increase compared with the first quarter of 2017. EBITDA amounted to EUR 22.0 million, with a margin of 43 percent. For the full-year, we expect profitability to be in line with the level achieved in 2017, with some fluctuation, both up and down, from quarter to quarter. During the quarter, we have continued our efforts in product innovation and providing an unparalleled end user experience, in combination with cost-efficient operational excellence, in order to further increase our lead over our competitors. Among other activities, we have launched Lightning Roulette and RNG Roulette. During its beta test period, Lightning Roulette has been widely appreciated by end users, and we have good expectations for its development as it is launched by an increasing number of operators during the year. In addition, we have started to roll out the RNG product, for which we also have high expectations for the long-term, despite the niche comprising a smaller share of the market. During ICE in February, we launched a total of seven new products that strengthen our leading position in the market. In parallel with the strengthening of our product offering, we have worked intensively with the completion of our third European production hub in Tbilisi, Georgia. We went live with the first tables in the beginning of April. The new Live Casino studio is the most advanced we have built to date, offering state-of-the-art technology as well as extended possibilities for our customers to optimise their client offerings through dedicated solutions. The studio has the capacity to accommodate our growth for the next two to three years. I am very proud of how quickly and efficiently the organisation has delivered on this project. I would also like to highlight our new studio in Canada, which is also our first studio outside of Europe. Launched in February, it serves customers of the British Columbia Lottery Corporation with ten tables and five games. The studio is the first licensed Live Casino facility in the regulated Canadian market. We have seen a strong start for our offering, even though the target market of British Columbia comprises a relatively small part of Canada. In terms of the general market development, we observe continued high demand for Live Casino both on the European level as well as globally. We are seeing a notably higher interest in the Asian markets among European licensed operators, which is positive and will become another growth driver going forward. As a B2B provider, our geographic exposure is primarily driven by which markets our customers choose to address, resulting in a high degree of geographical diversification. The United Kingdom is currently our largest market. The size of the market is mostly determined by a combination of population size and how different operators address the market. We rigorously ensure that all operators we add are properly licensed and comply with the requirements of each regulator. In conclusion, we have experienced a good start to the second quarter with increasing activity among our customers, and preparations ahead of the FIFA World Cup 2018 are in full swing. We have a very intensive period ahead of us with many tables to be delivered and go live. With extended studio capacity and new and upcoming game launches, we are increasing our lead over our competitors. It is our assessment that we have further increased market share over the last 12 months, and we see good conditions for continuing to strengthen our market leadership. An intensive expansions of tables and environments. Continue to take market share and increase the gap to their competitors. New Jersey Studio planned for the second half of 2018. 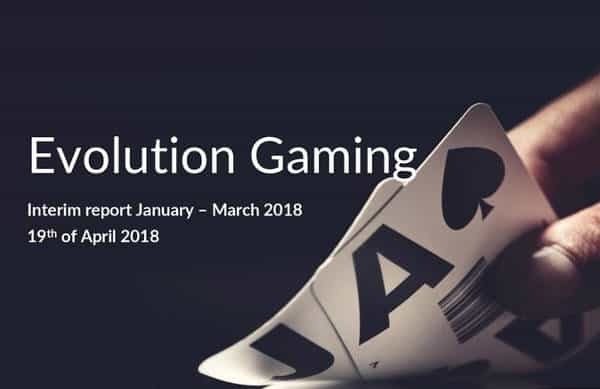 An impressive start to 2018 for Evolution Gaming. They are building on an already successful platform and now have in place the infrastructure to expand further. The Studio in New Jersey is an interesting prospect. It will be interesting to see which online casinos will take their games. Perhaps we may even see a new game or two being developed specifically for the American Market!